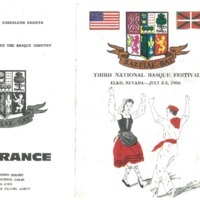 A collection of the programs for the annual Elko Basque Festival, held annually on the July 4th weekend. The National Elko Basque festival began with a celebration that brought sheepherders and cattle ranchers into town for a day of celebration. The State of Nevada celebrated its centennial in 1964, and the Elko Basque Club decided to organize another grand scale Basque festival to commemorate the event. They invited all of the existing Basque clubs to participate and to send musicians, dancers, and athletes to Elko for the event. Because of the success of the activities, and the geographical centrality of Elko to other Basque communities, Elko assumed the position of the site of the annual National Basque Festival. 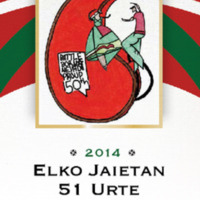 The official program of the 2014 Elko National Basque Festival, held on July 4-6, 2014. This was the 51st year of the Festival. 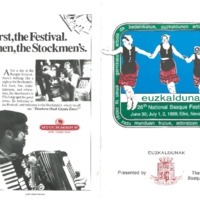 The official program of the 1989 Elko National Basque Festival, held from June 30 to July 2, 1989. This was the 26th year of the Festival. 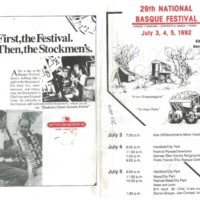 The official program from the 1979 Elko National Basque Festival, held 4-6 July 1979. This was the 16th year of the Festival. 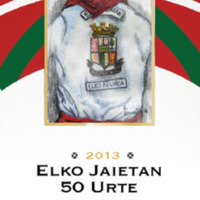 The official program of the 2013 Elko National Basque Festival, held 5-7 July 2013. This was the 50th Anniversary Year of the Festival. 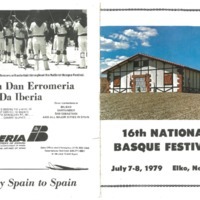 The official program from the 1991 Elko National Basque Festival, held 5-7 July 1991. This was the 28th year of the Festival. 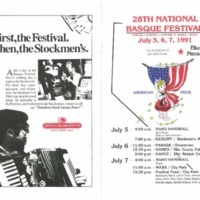 The official program from the 1992 Elko National Basque Festival, held 3-5 July 1992. This was the 29th year of the Festival. 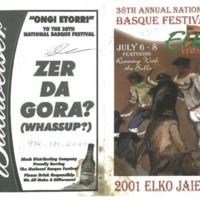 The official program from the 2001 Elko National Basque Festival, held 6-8 July 2001. This was the 38th year of the Festival. 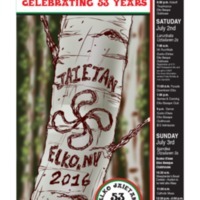 The official poster of the 2016 Elko National Basque Festival, in a letter-sized (8.5" x 11") format. The poster is marking the 53rd annual festival, and includes a list of events. For a full-size poster, contact the Elko Euzkaldunak Club directly. 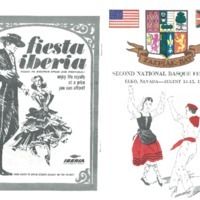 The official program from the 1965 Elko National Basque Festival, held 14-15 August 1965. This was the 2nd year of the Festival. The official program from the 1966 Elko National Basque Festival, held 2-3 July 1966. This was the 3rd year of the Festival.